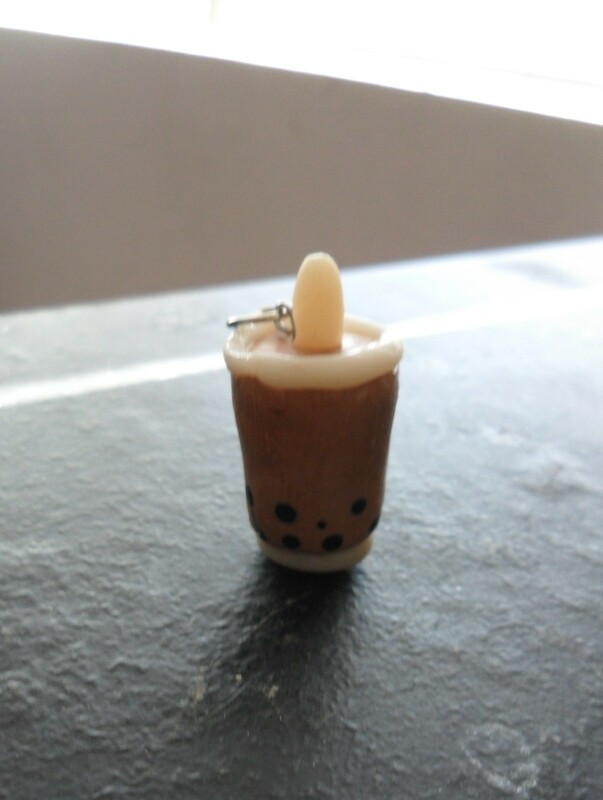 An adorable mini boba tea charm for anything! I saw a picture that somebody made these out of clay and I decided to give a shot at it. I used fimo soft clay but you can use whatever you prefer. Sorry I don't have pictures up for the steps, when I make more I'll take pictures! First, roll out 2 small balls of the translucent clay. One will be your bottom and the other will be the rim and straw. Then, knead together the brown and white clay to make a tan. This makes a "milk tea" boba, you can use whatever color clay you wish to match your preferences. I used orange for a mango one and a pink for strawberry. Take your kneaded clay and roll it into a fat coil. Make it somewhat tapered and make sure the top and bottom are flat. This will be your cup. Note: this step takes a little practice and work. Flatten one of the balls of translucent clay onto the bottom of the "cup". This will give the appearance of the colored clay being in a clear cup. With the second ball of translucent clay, roll a small coil and place it on the rim and shape to your preference. Then make a small, thick coil for the straw. REMEMBER, boba straws are fat to let the tapioca pearls through so don't be afraid to make it fat. Take an eye pin and place it next to the "straw." Bake the clay according to manufacturers instructions. Once cool, get small paintbrush, old pen or toothpick and randomally place small and larger dots on the bottom of the cup, this will be the tapioca pearls. You can also add a swirl to the "straw' for extra embellishments.